As I have started working on the sales pitch to the gourmets interested in exploring gastronomic delights of Istanbul I have naturally stumbled upon a question, "What makes Istanbul or well... the whole Turkey such a prime place to come for food?" It is akin to questioning why Germany is a car making nation, or why Italy is a world champion in the tile production, or why Denmark is an international leader in the wind powered mechanisms. My strategy consulting background has kicked in and I immediately thought of the perfect theory (framework, please) to explain the matter. It may be ironic that so soon I am resorting to the trade I have just left. I reckon this not only an outcome of my previous job training but also a natural disposition: anecdotal evidences (i.e. stories by my parents) confirm that by the age of 5 I started leveraging frameworks to explain to my dolls why snow falls in winter and making 3-point arguments to tell my parents why I prefer living with a grandma instead of joining them in the moving out. Ever since I have tended to think that such things as frameworks and 3-point arguments can be applied to any situation in life. So here is the situation, or the case: how come that Turkey has such a huge food and dining industry that makes the country a bombastic place to come and eat at? Believe me not but the answer is easy to find by using a framework developed by Michael Porter (one of the greatest strategy thinkers of our time and a founder of the firm I used to work for). The framework is casually called 'the diamond' as it has four key elements; altogether they explain why some nations are better than the others in developing certain industries. According to the framework, this happens when a country has unique specialized resources, demanding customers, fierce competition and a range of the supporting industries that altogether boost the quality of the provided products and services in the industry in question and hence its overall competitiveness. If I have not ruined your digestion let't go back to food. Here is the short answer: Turkey has such great food and dining because (1) Turkey has unique combination of history, geographic position, climate and resources that food and catering are thriving on; (2) Turkish customers (=eaters) are extremely demanding as their sensitive tastebuds have been nourished by the loving mothers; (3) Keen competition in the food and dining business in Turkey leaves no room for anyone producing anything less that delicious; (4) Turkey has a bunch of related industries ranging from growing vegetables to making fine copper cookware that help get the best produce and flavors to the Turkish tables. Sounds like a straight A, no? Now let's look over the yummy ingredients of the long answer. One of the facets of the diamond framework is endowment of the country with such factor conditions that are critical to drive the development of the industry in question. First, think of the Turkish history: the country once was the heart of the mighty Ottoman empire stretching over the current Balkans, Central Asia, Middle East and North Africa. What a variety of cooking traditions and ingredients ingenious to those regions to capitalize on! And so the Ottoman cuisine and then the Turkish cuisine as its successor did effectively turning all those influences into one of the first 'fusion' cuisines known to the world. Political and economic dominance fostered the culinary developments in many ways indeed: the very fact that the Ottomans once held control of the ancient spice trade route did not only allow them charge hefty taxes on the trade but also gave the Ottoman chefs access to the world's finest spices to cook with. Second, look at the geographic position and climate of Turkey. Taking advantage of the location between the three seas - the Black, Aegean and Mediterranean - Turkish cuisine features an exciting variety of sea food and different takes on cooking it - about 20 ways to prepare anchovy alone are known on the Black Sea coast. Climate-wise Turkey is a mixed bag of conditions ranging from mild marine on the Mediterranean coast to harsh continental in the South-Eastern Anatolia. No wonder that virtually anything grows in the country: as the Turkish government reports, Turkey is estimated to be cultivating about 11,000 plant species which almost equals to the total number of species cultivated in the whole Europe. This does give a mind-blowing variety of cooking ingredients for the chefs to work with at any given season and creates good conditions for the culinary creativity to flourish. Third, consider specialized resources such as labour and technology. Food and catering in Turkey is by and large considered a career and not a "temporary thing" as in many other countries: most of the people you see making and serving food in Turkey have been doing it for a considerable amount of time. The other day I was watching a man in a spotless white gown with a tie-bow at the legendary Istanbul baklava shop Güllüoğlu in Karaköy: he picked up pieces of the perfect baklava with such as a perfect deftness and arranged them so perfectly in the box that his excellence made me endlessly happy. Turkish food and catering does thrive on such specialists. While Turkish cooking remains a largely labour intensive there is some specialized technology developed to enhance it too: saç, inverted pan for cooking stuffed pancakes (gözleme) or oklava, thin rolling pins to make philo dough (yufka) for borek and balkava. Not to mention such revolutionary Turkish inventions as double tea pot (caydanlik) or coffee pot (jezve) that have been instrumental in maintaing the tea- and coffee drinking culture in Turkey. According to the diamond framework if the country has demanding native customers this naturally drives the quality of the product or service: the customers are so picky about every aspect of this product or service that they accept no less than the ultimate excellence - producers and suppliers are left with nothing but producing and supplying it. You will know what I am taking about if you ever cooked for a Turk. While this whole subject deserves a separate post for the purposes of this one I will stick to the relevant facts. 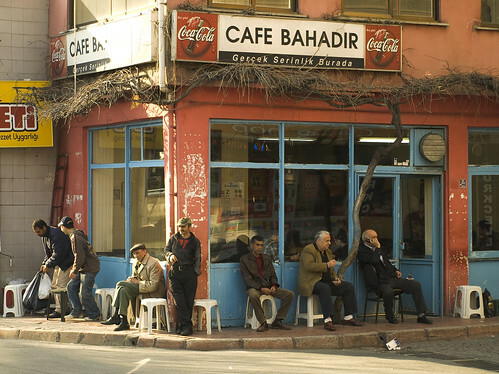 Turks do fuss about their food irrespective to the location, occasion and price of the meal. The fuss is mostly about getting the food that tastes exactly how it should and yes, if you ask a local on how a certain dish should be done, you will get a answer that is best digested over a meal. 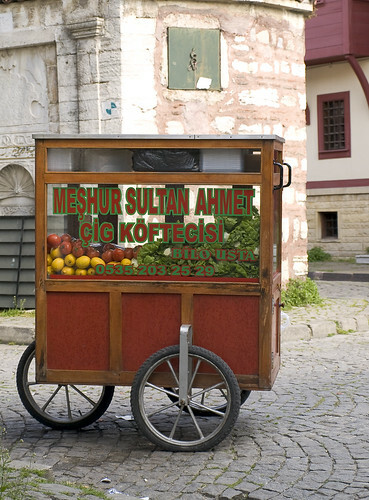 As a Turkish friend of mine mildly put it, "Turks have rather sensitive taste buds". They do which does not necessarily mean that they are looking for most refined, exquisite or even exotic tastes. In the contrary, Turks are rather conservative about their culinary habits (best of luck if you are looking for good international dining in Turkey). What that means is they are looking for the tastes familiar from the childhood - it is the loving Turkish mothers who should be held responsible for raising some of the most demanding kids to feed. But God bless this culinary conservatism of the Turks because this is what keeps their kebabs and baklava tasting heavenly for centuries. Another element that contributes to the competitiveness of an industry of the country is actually competition within the industry: the more rivalry is out there the higher the pressure for the producers and vendors is to provide the customers with the best in class. 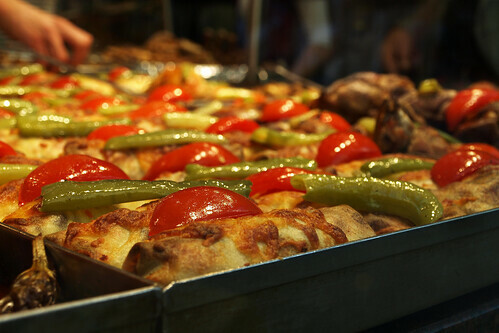 It does not take solid expensive market intelligence to figure out how fierce the competition in the Turkish food and catering is: just walk through any commercial district of any Turkish city to find the lanes packed with a mix of providers. Here are street vendors competing for your attention and a few lira you would pay for a quick snack being it a bagel with sesame seeds (simit), a portion of pickled vegetables with bread, grilled corn, peeled cucumbers, fish sandwich or a portion of meat balls (köfte). A more solid deal is offered by the small family-run eateries priding themselves on the dishes verified by the time and the incoming hungry crowds; or local taverns (meyhane) that along with a range of starters (meze) over a few glasses of raki (aniseed alcoholic drink) would offer an spectacular musical performance (fasıl) by a band and the guests themselves. Then there are specialty shops: decades of traditional recipes and generations of loyal clientele have made them shrines where people come to meditate over a kebab or perform a ritual of indulging a chicken pudding. All this still leaves space for finest restaurants featuring fusion influences and the resulting contemporary Turkish cuisine spiced up with a roof-top view, DJ-performace and high heeled guests. How does one compete in such an environment where all the spots are taken? Well, I would open a non-Turkish food restaurant if point (2) did not hold. Therefore the players in the Turkish food and catering business are bound to turn some deliciousness on your plate because if they don't you know they definitely will next door. Finally, the diamond framework says that if the country has other industries producing products or services that can become inputs for the industry in question this will help boost innovation and competitiveness of the industry in question. 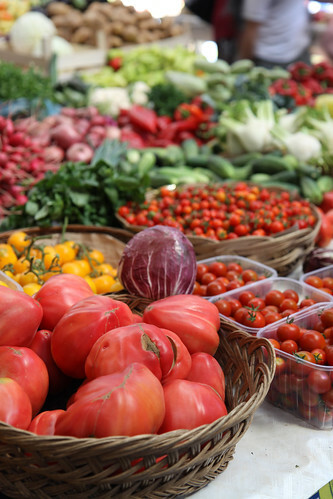 A no-brainer related industry for food and catering is agriculture and agriculture is big in Turkey employing about one forth of the population and contributing about 8% to the country's domestic product (GDP). In the more practical terms, you can witness the roots and shoots of the richness of the Turkish cuisine as every season you will find local markets bursting with the local produce of the sun-nursed-n-caressed fruits and vegetables, ripe cheeses, dry and fresh fruits and nuts. The local stuff I buy in Turkey is clearly different from the Turkish imports I find in Russia - I am not sure whether the warm of the sun and the rich aroma vanish during the transportation or they have never been there for the food stuffs that Turkey imports. Here in Turkey the story is different: I laugh when I hear organic because many farmers here have never thought that their crops could be anything else. With this kind of supply you would create some of the world's yummiest dishes too, would not you? Another interesting example of a related industry for food and catering is ... coppersmithing. Availability of the copper and its excellent head conducting properties make it a great material for a wide range of cooking utensils that have bee traditionally used in the Turkish cooking. You will surely see those beautiful hand-made bowls, plates, cups, trays, cooking pots and serving dishes in the shops and markets that have been used from the Ottoman times until the present day. 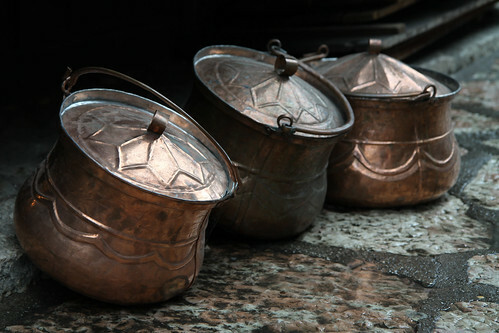 Now think how coppersmithing has been helping Turkish cooking over the centuries: how a chef would come to purchase an item from a coppersmith and then come back with the suggestions on how to improve that item to make it more "user-friendly", as we call it this day. Or that coppersmith sharing his knowledge of the material with the chef to help the chef use and maintain that item in a better way. This is exactly what we call innovation nowadays and exactly what has resulted in the superior taste and texture of the Turkish pilav traditionally cooked in a copper pot. Now, tell me you are not sold and have not booked your flight to Istanbul yet? Or tell me I have missed something and I will make sure to include the reasoning to convince you better? different culture, different taste. I would love to explore many country and to taste there famous recipe. I'm jealous on you Sigh. This looks divine.